For example, a human head weighing 12 pounds held forward only 3 inches from the shoulders results in 42 pounds of pressure on the neck and upper back muscles. That's the equivalent of almost three watermelons resting on your neck and back! When you neglect your posture, you invite chronic back pain. Rounding your low back while sitting for extended periods of time in front of a computer, standing for hours stooped over, sleeping improperly and lifting poorly can all lead to debilitating aches. Maintaining the natural lumbar curve in your low back is essential to preventing posture-related back pain. This natural curve works as a shock absorber, helping to distribute weight along the length of your spine.Adjusting postural distortions can help stop back pain. A basic remedy to sitting all day is to simply get up! Frequently getting up from a seated position and doing these six quick and easy realignmentexercises can help you reeducate your muscles from getting stuck in a hunched over cave man position. Stand with your back against a flat wall with your feet about four inches from the base. Maintain a slight bend in your knees. Your glutes, spine and head should all be against the wall. 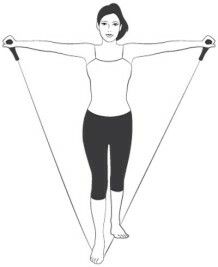 Bring your arms up with elbows bent so your upper arms are parallel to the floor and squeeze your shoulder blades together, forming a letter "W" (image at left). Hold for 3 seconds. Standing in a doorway, lift your arm so it's parallel to the floor and bend at the elbow so your fingers point toward the ceiling. Place your hand on the doorjamb. Sit on the floor with your legs extended forward. Place the middle of the resistance band around the bottom of your feet and cross one side over the other to form an "X". According to a 2013 study by the Scandinavian Society of Clinical Physiology and Nuclear Medicine, performing this simple resistance band exercise 2 minutes a day, five times a week, will significantly decrease your neck and shoulder pain and improve your posture.